In the latest addition to our popular spotlight series, we are discussing the decadent Vegas Robaina Cigar. We consider both its flavours and history, so that your next Vegas Robaina smoke will be enjoyed on an intellectual level too. To write of the Vegas Robaina brand is to tell a tale about how a rural family in Cuba succeeded in becoming a giant in the cigar industry. Their story begins in 1845, when the Robaina family first began to farm tobacco in the fields of the San Luis district, in the Vuelta Abajo region. The history of the tobacco industry in Vuelta Abajo dates as far back as 1830 and is now one of the five tobacco regions of Cuba. The Robaina family chose well to settle in the Vuelta Abajo back in 1845, as tobacco aficionados consider the tobacco grown in the Vuelta Abajo as the best in the world. The Vegas Robaina family soared to tobacco royalty with Don Alejandro Robaina. It was his knowledge and skill that helped his plantations to be so successful. His success can be measured against the average production rates of other tobacco farms, which were approximately 35%. Don Alejandro’s crops frequently produced a harvest, of which 80% was deemed fit to use as wrapper leaf. The wrapper leaf is an important aspect of a cigar’s worth. A good cigar should have a beautiful wrapping leaf, which is flawless in appearance, with smoothed veins and no tears. Less than 10% of all tobacco is accepted as wrapper-grade – another indication of Alejandro Robaina’s skill. The Robaina family grew their tobacco for the Habano brand of cigars, and upon Alejandro’s passing in 2010, Habano chose to honour this master in the cigar trade by naming a set of their cigars after him and his family. When you smoke a Vegas Robaina cigar, you are engaging in a rich history of cigar farming that has led to some of the best farming techniques in the industry. Each of the Vegas Robaina cigars is artfully named; the size 7 5/8” cigars are named after Don Alejandro himself – Vegas Robaina Don Alejandro Cigars. A box set comprised of 25 Size 5 7/8” cigars are similarly named – Vegas Robaina Familiares – Vegas Robaina Relatives, continuing the strong family themes. In this section, we will give an overview of the flavour profiles and prices of the Vegas Robaina cigar sets. Sold in singles at £31.50 because there was only one Don Alejandro Robaina in the cigar trade, the Don Alejandro cigar is a beautiful Double Corona rolled in Cuba. Its taste is halfway between medium and strong and has a delicious mix of subtle sweet, woody and earthy notes. You can get this cigar gift wrapped for an extra £3.99. The Vegas Robaina Familiares cigars are priced at £17.50 individually but are best bought as a pack in their beautiful box of 25 for £370. Buy them as a pack and commemorate the efforts of over 150 years of the Robaina family in the tobacco trade. The Familiares cigars have a rich and creamy taste. A single Famosos will cost £19, or they can be purchased as a box of 25 for £432. These are strong cigars – 4 out of 5 – and their minimum smoking time is 40-60 minutes.  This is a cigar like a good glass of whisky, to be sipped and enjoyed over a long period. The Vegas Robaina Famosos cigars are sure not to disappoint. The Vegas Robaina Unicos are named Unicos, meaning ‘unique’, because they are the only cigar in this set to feature the pyramid style vitola, but are nonetheless acclaimed as the best Piramide cigar available. Much like the Famosos, the Unicos are very strong cigars – 4 out of 5 – with a minimum smoking time of 40-60 minutes. The Unicos cigars are a flavourful sensation, being a smooth yet spicy ride from the start, but including a poignant leather note in the middle, with aspects of coffee and pepper in the last third. 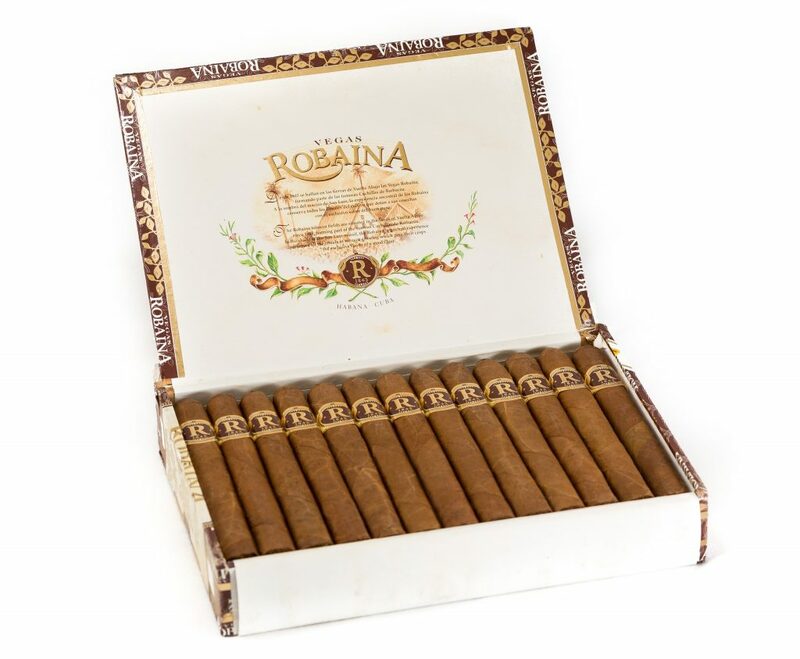 The Vegas Robaina Unicos cost £26 for a single, or you can purchase a box of 25 for £560. Vegas Robaina Classicos – Size 6 1/2"
For a moderately light cigar with a strength of 2 out of 5, the Vegas Robaina Classicos are unconventionally spicy and leathery, perfect for the novice cigar lover who is still testing a range of cigars against their palette. Classicos are £20 per single, or you can purchase a box of 25 for £430.